Much is made today of divisions in the Christian Church. However in reality the core doctrines and beliefs of both Catholic & Protestants are the same. The great schism came about largely due to the actions and corrupt practices of the medieval Catholic Church. The split started when a German Monk named Martin Luther, who was so disgusted with the behaviour of Catholic clerics, initiated what we would call today a ‘Back to Basics’ campaign. In this article we look at what happened at this seminal moment in Church history. For the first thousand years of its existence, the Christian Church lived up to the promise made in the Apostles’ Creed, its statement of faith, to be “one, holy, catholic and apostolic’. Throughout this time, however, there were ongoing tensions between various parts of the Church about doctrine and organization. In the eleventh century came the break between Western and Eastern (Orthodox) Christians. And then, at the start of the sixteenth century, Martin Luther, a German monk, precipitated the Reformation, which has left division in its wake to this day. By the late 15th century, the papacy appeared to be more powerful than ever. The Catholic church made great show of wealth, the commissioning of great works of art and along with the decadent lifestyles of some popes the impression was of an institution in rude health. Beneath this façade, however, Christianity was in moral and spiritual decline. Some of the clergy began to despair of the conduct of the popes, such as the Borgias pope, Alexander VI (1491-1503), who was installed while his children from various illicit liaisons looked on unabashed. A series of often small reform movements began working for spiritual renewal and a return to high moral ideals in the theory and practice of the Church. However none reached a level where it could effectively challenge the papacy. For Luther, the ultimate source of Christian authority was not the say so of the Pope, or the traditional practice of the Church, but the Bible. In 1521, as the battle raged between the German princes who defended him and the papacy that wanted to silence him, Luther set himself the task of translating the New Testament into German. There had been earlier efforts to make the Bible available in the vernacular – local language – rather than Church Latin. The difference was that Luther returned to the original Greek version to rediscover the Bible’s true meaning plus his use of the sort of German spoken by ordinary men and women. He wanted to make the Bible accessible to all. 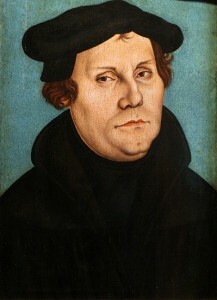 He published his New Testament in 1522, and a full German version in 1534. Elsewhere, a Dutch Bible (1526), a French Bible (1528), and eventually in 1611, the King James Bible, were produced. It was against this backdrop of corruption and disillusionment among believers that Martin Luther began publicly questioned the practices of the Church in the early years of the 16th century. He was a skilled orator who knew the Bible well, unlike many of his contemporary illiterate clergy colleagues. His ‘Back to Basic’ arguments were based solely on the teachings and events in the Bible and not on dogma and ritual practices that evolved in the Catholic Church. 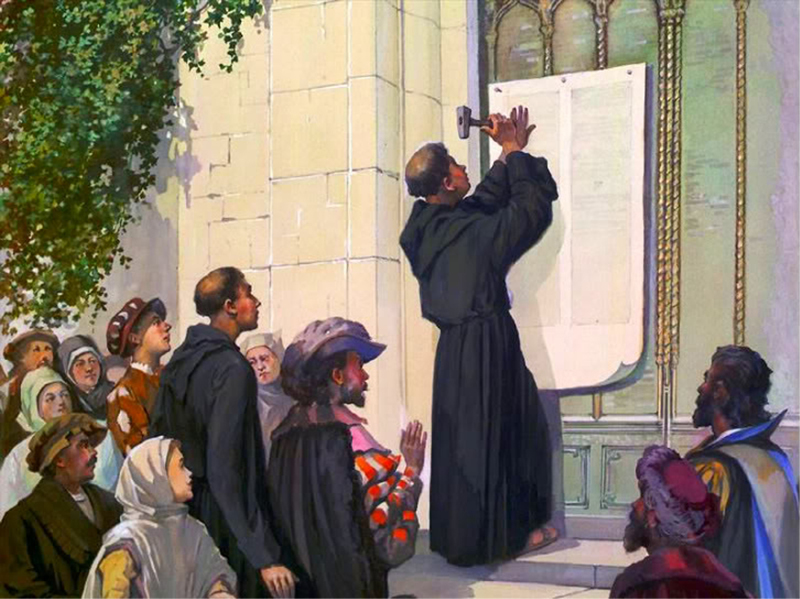 There was a theological basis to his rebellion, as laid out in the 95 Theses he famously nailed to the door of a church in Wittenberg in Germany 1517. He rejected the notion, central to Catholic Christianity then that by doing good deeds you were contributing towards a place in heaven after death. Salvation came through faith in God. It was not an individual’s holiness that counted, it was God’s love. The background to Luther’s Ninety-Five Theses centres on practices within the Catholic Church regarding baptism and absolution. Significantly, the Theses reject the validity of indulgences (remissions of temporal punishment due for sins which have already been forgiven). They also view with great cynicism the practice of indulgences being sold, and thus the penance for sin representing a financial transaction rather than genuine contrition. Luther’s Theses argued that the sale of indulgences was a gross violation of the original intention of confession and penance, and that Christians were being falsely told that they could find absolution through the purchase of indulgences. Martin Luthers ‘rebellion’ was aided by the fact that his cause was taken up by German princes keen to loosen the papacy’s grip on their lands. He realised that he had found powerful political sponsors who enabled him to escape arrest and punishment by the Church, and condemnation by the Holy Roman Emperor, Charles V, at the Diet of Worms in 1521. Luther grew in boldness. The period known as ‘The Reformation’ was now fully underway. He rejected five of the seven sacraments that the Church taught, attacked the authority of the Pope and advocated church services in the local language rather than Latin. The breach grew wider. At a gathering in Regensburg in 1541, there had been hopes of a reconciliation, but Luther’s demand for married clergy and independence from the Pope proved too much. Following the Reformation, the Catholic church knew that it had to make some changes in order to enable it to survive and regroup. The exact nature of the fightback was decided at the Council of Trent, which met, at intervals, between 1545 and 1563. It re-examined controversial doctrines, insisted on priestly celibacy, uphold ihe seven sacraments and endorsed the supreme authority of the Pope but accepted that some of the old abuses had to be stopped. Catholicism was restored in some lands where it had lost influence – France, Poland, the southern Netherlands and parts of Germany – but religious division was ever after part of the face of Europe. The word Protestant was first used at the Diet of Speyer in 1529 to describe those who questioned the authority of Rome. It was 12 years after Martin Luther had sparked the Reformation with his rebellion against the papacy. Over the subsequent centuries, the term has been applied to a variety of denominations, including Lutherans, Presbyterians, Baptists and Anglicans. What unites these groups is an emphasis on individual study of the Bible, simplicity of worship and a belief in the importance of preaching. All these features can be traced back to Luther’s original dispute with Rome.